Ashippun is perhaps named for the Indian word for raccoon which is what the Indians called the river which flows through the eastern part of the town. The three people credited with being the first settlers in the Town of Ashippun were Samuel Marshall, Alexander Leslie and Leslie's son, Alexander Jr. Soon after arriving. Leslie and Marshall erected a sawmill on the banks of the river where Alderly now stands. Hans Gasman had come from Gjerpen and settled at Pine Lake in 1843 and entered a claim for 480 acres in sections 35 and 36 in the later part of 1843. One of the first claims for land in the township was on 10/17/1842 by Elizabeth Graham in the NE 1/4 of Section 13. Most of the terrain in the early days was brush and woods as the land was described as "wooden wilderness." As settlers came to the Town of Ashippun, each one had to make a log cabin. Usually the first one was small and put up in a hurry. Cabins were easy to make because there was choice timbers in the dense forest of Ashippun. In 1847 the township had 750 residents which grew to 1017 by 1850. Many of the towns residents emigrated from the east coast, Norway, Scotland, Ireland and The Isle of Man. 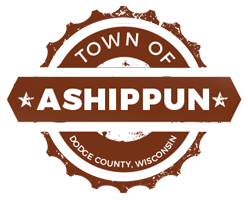 The Town of Ashippun is a limestone region with outcroppings visible in the northwest section of the town, which is referred to as the lime ledge area. The town has one river (Ashippun) which is found in the eastern section of town. There is one small lake in the northeastern part of the town called Collins Lake. The land as a whole is very hilly and the glacier's effects are quite evident. Several large rocks can be found in the northwestern part of the town while there are drumlins, eskers and moraines in the western part of town. The western part of town was the spillway of the melting glacier and the eastern part displays the drift of the Kettle Moraine area. Agriculture attracted the first white settler to the county, who located near Watertown in 1836. In 1838, settlers located the Fox Lake and the government offered the land in the County for sale. Dodge County's population in 1838 was 18 people. In 1839, Fox Lake became the first settlement and Waupun the second. In 1840, the 67 resident of Dodge County organized a county government. Beaver Dam and Oak Grove was established in 1841. Early agriculture in the county focused on wheat, oats, corn, potatoes, apples and livestock. Many parts of the county were covered by forest, although oak savannas, wetlands and prairie were also common. Dams for sawmills and grist mills were established in 1838 in Watertown, 1840 in Columbus, 1841 in Beaver Dam, 1844 in Danville, and 1845 in Hustisford and Fox Lake. Dams and mills soon followed at Horicon, Portland, Kekoskee, Mayville, Theresa, Rubicon and Ashippun. Timber was used for local construction, but after the discovery of iron, much of what remained was converted to charcoal for smelting. Hotels were built in Fox Lake in 1839 and Beaver Dam in 1841. The first store opened in Waupun in 1845. In 1848 a newspaper began publication in Beaver Dam. The first road through the county was cut after 1843 between Watertown and Fox Lake. A stage was operating by 1848 and a railroad was completed in 1856. The state prison was established in Waupun in 1852. A bank opened in Fox Lake in 1854. The county population reached 149 in 1842. Settlement of Dodge County largely occurred between 1842 and 1860. The population surged to 7787 by1846, reached 19,140 by 1850 and by 1860 more than 44,500 people lived in Dodge County. A major share of the newcomers was native-born Americans from the east and German immigrants. Scandinavians, Welsh and Irish were also important. Nearly all of the many communities in Dodge County were well established by 1860. Manufacturing in Dodge County, of the goods needed by limited local markets, is nearly as old as white settlement itself. Watertown had a wagon factory in 1841, added a brick factory and flour mill in 1842, a woolen mill in 1844, a distillery in 1845 and a brewery in 1848. By 1850 there were 30 manufacturing plants in the county. The early 1850's saw the opening of a tannery in Watertown, a flour mill in Hustisford, a foundry and iron manufacturing company in Horicon and a plow factory in Waupun. Farm implement manufacturers were established in Beaver Dam and Watertown in 1855. Iron was discovered in the Town of Hubbard at Iron Ridge and in the Town of Williamstown in the 1840's. A blast furnace was built in Mayville in 1849. From 1869 to 1872, about 174,000 tons of iron ore were removed.